The areas of life that don’t work are not the problem. They are the symptom. At any moment, the people in your life are the way they are and your situation is the way that it is. This is true whether you like it or not. When you are at peace with the truth, you have peace of mind and are very effective. You see clearly and can see what you need to do. When you fight the truth, you become full of fear, upset, and tunnel vision. You lose your ability to see clearly and are forced to act destructively. All you can do is fight, resist, hang on, and withdraw. When you were born, you were pure love, but you were born into a world that suppresses this state. Then you got hurt and you got hurt a lot. You experienced rejection, invalidation, and painful losses of love. As a little child, the only way you could explain these painful losses of love was to blame yourself. "Clearly I'm the problem." In a moment of hurt, you decided that you were worthless, not good enough, not worth loving, a failure, or some other form of feeling "not okay." It wasn't the truth that you were this way, but in the eyes of a little child, it became your truth. You then took this a step further and fought the very belief that you created. "Worthless is a horrible way to be." You fought the belief and you fought all the hurt that came with it. From that moment on, the primary, subconscious focus of your life would be to avoid this hurt. It's the automatic avoidance of this hurt that gets us in trouble. Any circumstance that triggers this hurt is perceived subconsciously as a threat. To avoid this threat, we fight, resist, hang on and withdraw. We destroy love and create lots of suffering. Let’s say that you and I have a relationship. No matter how wonderful you may be, you will never be wonderful enough to keep my hurt from being triggered. When it does get triggered, I won’t notice that I have a nerve that is being struck. I will only notice what triggered it. YOU! Subconsciously, I will perceive you as a threat. In an automatic attempt to avoid this threat, I will get defensive and put up my walls of protection. I will become judgmental, critical, and act destructively. This then triggers your hurt. In an automatic attempt to protect yourself from me, you will do the same thing. You will put up your walls of protection and become judgmental and critical of me. Then my hurt gets triggered even more and I become more critical of you. Then you become more critical of me. Then I become more critical of you. Without knowing, we create a cycle of conflict, a cycle of hurting, attacking, and withdrawing from each other. This cycle then goes on and on without either person ever noticing his or her role in the conflict. The problem may seem to be what the other person is doing, but this isn't the problem. This is the symptom. The real problem is the cycle of conflict and the nerves that are fueling it. Fortunately, all of this can be healed. To learn more, get the video course or schedule an appointment. I can walk you through the healing process. In the next few articles, you will learn more about how these issues sabotage your life and how they take away your power. 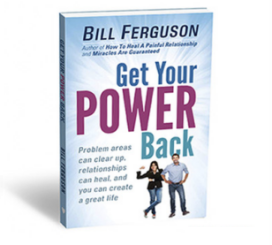 Then you will learn how to get your power back and turn your situation around.